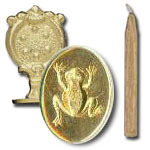 Our Brass Seals are imported from Florence and made by Italian craftsmen. Handle is 1 1/2" Tall with a 1" oval impression. Comes in a presentation box and includes a stick of our premium gold sealing wax.